Again there isn’t one. Too many authors to squeeze onto the back of that fair maiden’s dress. A tag line might have involved adding a train to that lemon sorbet, ribbon bedecked, shawl covered ensemble. Let’s face it, even a Lady can’t work that much look! There are quite a number in this story told in three parts – Lady Carolyn (already married / matchmaker extraordinaire), Miss Katherine Peyton (plain spoken, elf woman), Miss Gwendolyn Passmore (stunningly gorgeous and stunningly shy) and Lady Georgina Sorrell widow and convenient bestie of matchmaker). Again there are a number – Hugh Dunne (the horse obsessed, tactless Earl of Briarly and the matchmaker’s brother), Captain Neill Oakes (he of the too many l’s with a mysterious war hero past) and Alec (pushover Lord of Charters). If I had Octavia as a sister, I would have sold her into slavery. While Lord Charter’s sibling isn’t evil incarnate, she is freakishly annoying. 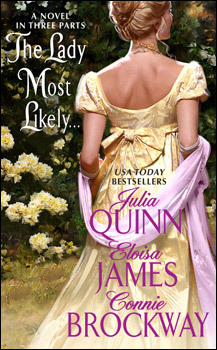 It speaks to the effectiveness of the Gwen character and the way in which Julia Quinn crafted a breathtaking woman who would rather hide under the table than receive compliments from a hoard of beaux. While Octavia’s jealousy is justifiable, she needed to be sketched out more to make her less of a harridan. To be honest, they all did. However, the most emotionally satisfying storyline was that of the least recognisable contributor (this is becoming a habit for me). Connie Brockway’s story of two characters who dug each other in a mighty way and never really conveyed it was convincingly told. You could really feel Kate and Neill’s (again, unnecessary ‘l’) investment in one another, years of shared experiences and genuine understanding of one another. While the inner dialogue did assist in that, Brockway’s dialogue could have done that alone. She was shockingly successful in such a small page count. What worked for this reader was the dynamism of the pairing, it was really about charging forth without thinking the scenarios through. They both felt for one another from the beginning but their need to be with one another was hampered by their recklessness. Loved it. In some respects the remaining pair felt like a consolation prize. They weren’t but it was like handing off the last two prizes on the shelf. The three stories, novellas if you will, were nicely contained but their truncated length made the connections between characters pretty speedy. So speedy that there were gaping holes of time frame incredulity, especially in terms of how quickly one shy miss went to a certain base (if you know what I mean). It’s a format that worked. Whomever had the duty of threading it together with the introduction and concluding scenes did a fabulous job in making three disparate styles quite seamless. ‘The Lady Most Likely...’ gives me further reason to search more novella compilations out immediately.